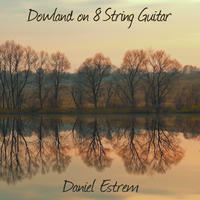 Daniel Estrem : Dowland on 8 String Guitar. John Dowland (1563-1626), an English Renaissance composer, singer and lutenist was the period's most renowned and significant composer of lute solos, lute songs (voice and lute) and consort music. His popularity and recognition during his lifetime appear to be at odds with how he perceived himself. Perhaps he had a realistic view of his place in the panorama of history. His melancholic lyrics and music have often been described as his creation of an "artistic persona", for he was actually known to be a mostly cheerful person. Dowland composed some 90 works for solo lute, many of which are dance forms. Melancholy does not dominate this album of Dowland's lute music played on 8-string guitar. The works, instead reflect a variety of moods and settings. It is said that Dowland was musically influenced by his numerous travels to the continent and there are instances in his music that sound like glimpses of the future. In the last 40 seconds of the final track on this album ("A Fancy") one can hear the tremelo of Francisco Tarrega's famous guitar piece "Recuerdos de la Alhambra" followed by a pattern similar to the one used by Isaac Albeniz in his celebrated "Leyenda" (Asturias). Both of these Spanish classics were written about 300 years after Dowland. License Colorful classical guitar by Daniel Estrem for your project. Play the music of Daniel Estrem in your restaurant or store.